Honda plans to dent Maruti’s sub-4 metre dominance with the all-new Amaze. But, has it done enough to make it more desirable? 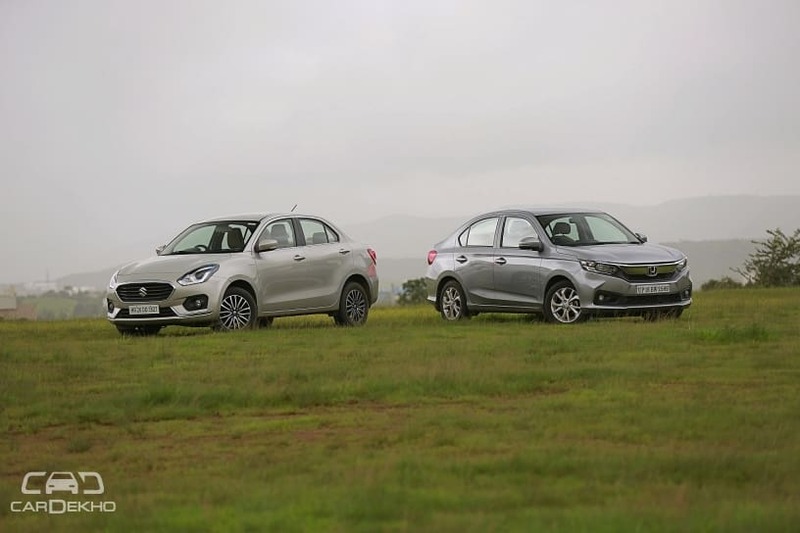 Both entirely new cars, the new Dzire and the Amaze, promise to offer buyers a whole lot of practicality wrapped in packages rich in features and premiumness. But, which one does a better job of offering the complete sedan experience? Both cars look the part as far as average sub-4 metre sedans go since designers have to play within restricted boundaries, resulting in a flat cut at the nose and the tail. While the Maruti Dzire opts for a curvy and flowy design, the new Amaze has an almost SUV like charm with its boxy edges. The Dzire plays it safe in the design department, and will be easy on the eyes for majority of the buyers, but won't make people fall in love with it. The most striking angle of the Dzire is from the front with the LED DRLs on. Also, because it is wider than the Amaze, it looks more imposing. Even from the side, the Dzire looks better with its multi-spoke, two-tone R15 alloy wheels. The most striking angle of the Amaze has to be its side profile. It looks sharp with the strong shoulder line running across the car and has better ‘sedan’ proportions as it is lower, and has a longer wheelbase than the Dzire. The rear of the Amaze does look good, but the use of halogen bulbs as compared to the LED elements of the Dzire make it lose a point. The Amaze’s overall design is a little more polarising, but has the potential to pull on the heartstrings. Both cars get largely functional cabins and sport dual-tone layouts to make them look premium. But, where the Dzire goes heavy on beige, the Amaze’s dashboard is dominated by black inserts. When it comes to the seats, the Dzire’s feel more comfortable and better contoured. The seats of the Amaze feel softly padded and will feel a bit uncomfortable on longer journeys. They also aren’t as supportive for those with broad shoulders. Also, space management at the front is better in the Dzire than the Amaze, thanks to the better dashboard contouring for your knees. So if you are tall, the Dzire is a better car to be in. Moving on to the rear bench, both cars get centre armrests but it’s the Dzire which gets a rear AC vent. In terms of comfort, it's again the Dzire which offers you better padding and a more comfortable seating posture with adjustable headrests. What the Amaze does better is deliver a sense of airiness. With a lower window line and smaller front headrests, it makes the cabin seem bigger than it is. The Amaze also has a wider rear seat base and more kneeroom. But because the front seats are lower, they have to be pushed back to get comfortable, making the Amaze lose this advantage. If we had to pick one of them to spend time in, it would be the Dzire. And that is because it offers a better sense of premiumness with the wooden accents, a leather-wrapped, flat-bottom steering wheel and the centre console layout. And while the cabin of the Amaze is also a nice place to be in, some elements like the gear knob, the rubber gear stick cover and piano black accents on the dashboard feel like they belong in budget cars. Where the Dzire edges ahead is its lighting setup. It gets LED projector auto headlamps, LED DRLs and LED taillamps. And these don’t just look good, but illuminate the road ahead better as well. Inside the cabin, you get a 6-speaker setup in the Dzire for a better audio output, as compared to the Amaze’s four. Also, the Dzire gets wider 15-inch 185/65 tyres as compared to the 175/65 of the Amaze. What the Amaze offers over the Dzire is just cruise control. Then comes the fight for suitcases, which the Amaze wins hands down. Where the DZire gets 378 litres of cargo space, the Amaze edges ahead with a class-leading 420-litre boot. It can easily take in a couple of travel suitcases and bags, and maybe a medium travel bag over the Dzire. Overall, even though both the cars are neck to neck in terms of features, it’s the Dzire which edges head because of its all-LED lighting. When you compare the engine specification of the two cars, the Amaze promises a punchier drive and it lives up to it. The Honda uses a bigger 1.5-litre diesel engine as compared to the 1.3-litre motor of the Maruti. It makes 25PS more power than the Dzire and 10Nm of additional torque. And both of these outputs are delivered at a lower rpm too. When you drive these cars back to back, this difference in power really comes to the fore. The Amaze accelerates with a sense of urgency, with the engine coming alive close to 1750rpm. The Dzire, on the other hand, has a more laid-back character. It accelerates smoothly and at its own pace, with the power kicking in beyond 2,000rpm. In daily commutes, both engines get the job done easily but it's the Amaze which lets you make quick overtakes more easily. When tested, the Dzire went from 0-100kmph in 12.38 seconds, while the Amaze managed the same sprint in an impressive 10.21 seconds. Even in the roll-ons from 30-80kmph in third gear, the Amaze was half a second quicker than the Dzire. Now, you might think, with its better performance, the Amaze would be less efficient than the Dzire. But no. While the Amaze returned 19.68kmpl in the city, the Dzire managed 19.74kmpl. That’s neck to neck. The difference on the highway is more, of 4kmpl with the Dzire in the lead with a massive 27.38kmpl because of its taller gearing. When it comes to engine refinement, it’s the Amaze which inches ahead. The Dzire feels noisier, especially when revved hard. The Amaze's engine doesn't sound strained even at higher rpm. If there would be one complaint, it would be the diesel vibrations of the Amaze which comes into the cabin via the floorboard and strangely through the steering wheel as well. If you value acceleration and performance, its the Amaze which takes the clear victory. The Dzire on the other hand is a calm commuter but still won't have you complaining in the city. When it comes to the suspension setup, the two are quite different. The Honda is more softly sprung than the Dzire, which means it should be better on speed breakers and potholes, right? It is, but only on slow speeds. The Amaze filters broken roads and potholes better than the Dzire. But as speeds increase, the ride tends to become bouncy. The Dzire’s suspension is very well damped. Driven back to back, the Amaze does let you feel more of the road surface, but it's not something which would bother you. Also, the stiffer damping helps it remain stable over broken roads and quickly settle down after speed breakers. When it comes to handling, both cars exhibit similar traits - those of a typical city runabout. But, it's the Dzire which has a lighter steering wheel, a lighter clutch and inspires more confidence in corners with less body roll. The steering of the Amaze feels unnecessarily heavy and vague as compared to the Dzire’s. Both cars get dual airbags, ISOFIX mounts and ABS with EBD as standard. Moreover, both of them get rear parking cameras in the top-spec variant, but it’s the Amaze which offers reverse parking sensors as standard. Choosing between these two cars has been difficult. Both of them are brilliant for city use, and even on certain parameters where one is better than the other, it's by a very tiny margin. And because the margin of difference being so little, we decided to make a table to help us pick out a winner. The Honda Amaze is a very well rounded package. It packs modern features, latest safety tech and is pretty comfortable to be in. But, the primary reason to choose it over the Dzire would be the punchy engine. It smokes the Dzire when it comes to outright performance. But on almost every other count, the Dzire manages to inch ahead of the Amaze, which makes it our pick of the lot.